Before the ground-breaking, paradigm-changing, outside-the-box 8-track tape came the 4-track tape, itself a marvel of modern technology. 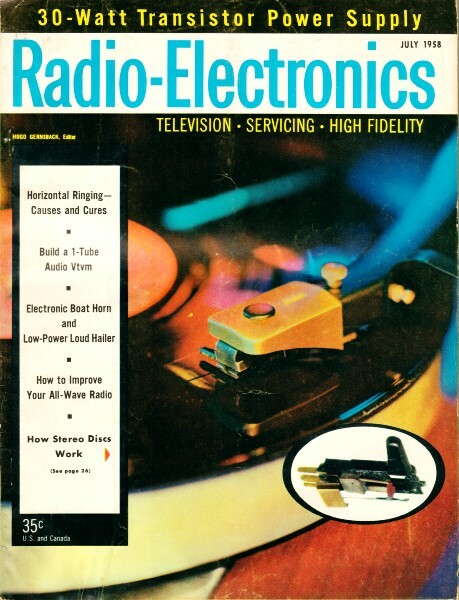 This brief announcement regarding its imminent introduction to the music storage and playback world appeared in the July of 1958 of Radio-Electronics, barely a month before my introduction into this old world. Many people did -and still do - scoff at the mention of an 8-track tape deck and assorted tapes. I actually preferred them over the snobbishly preferred cassette tape because unlike cassettes where you had to run serially through each song to reach the next, or through several if noncontiguous on the tape, the 8-track featured parallel recordings so that switching from one song to the next was instantaneous. Some 8-trackers, yielding to the pressure of cassette elitists, bought those ridiculous adapter units that inserted into the normal 8-track tape slot and allowed you to play a cassette tape. My '69 Camaro routinely blew the doors off of cars with cassette players installed. 'Nuff said. What the prerecorded tape cartridge looks like. How four tracks are placed on 1/4-inch tape. Competition for the stereo disc is on the horizon in the form of a competitively priced prerecorded four-channel tape, completely enclosed in a cartridge. 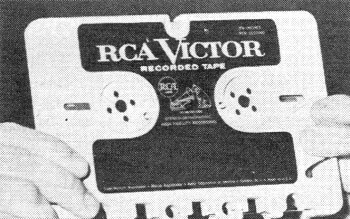 RCA is marketing the tape cartridges as well as a tape player which accommodates them. Professional equipment for making the four-channel recordings is being manufactured by Ampex. The prerecorded four-channel tapes are designed to provide an hour of stereophonic music at a price equivalent to that of stereo discs. The tape plays at a speed of 3 3/4, inches per second, has a separation of .025 inch between tracks. One set of two stereo tracks plays in one direction ; then by reversing the direction of the tape, the other set is played. Tape width is .043 inch. One big advantage of the cartridge-loaded tapes, according to the manufacturers, is that they may merely be dropped into the tape player - as easily as playing a phonograph record. Stereo discs are already off to a strong start, and are on the market at prices from $3.95 to $6.95. Among stereo discs now becoming available across the country are those bearing the labels of RCA Victor, Capitol, Decca, ABC-Paramount, Hallmark, Urania, Esoteric, Contemporary, Electra and Omega. Columbia Records, which had announced its own "compatible" stereo system, changed its mind and joined the rest of the industry in conforming with the 45-45 standard. Such old-line radio and television manufacturers as Motorola, Zenith, Westinghouse, Admiral and Magnavox have already indicated that they plan to incorporate stereo disc players in future hi-fi models. The jukebox makers aren't ignoring the possibilities of stereo. At least one manufacturer is working on a model which can accommodate stereo discs.